The saltmarshes of Ireland are one of the country’s most important and special natural features. While they form less than 1% of the land area of Ireland, they provide special conditions to support plants that grow nowhere else, and also provide roosting sites for waterbirds and grazing for livestock. Scientifically important habitats within saltmarshes range from a pioneer zone where specialist plants colonise the mud, through established saltmarsh habitats with pans and creeks, up to where the saltmarsh transitions to dry land habitats. These areas also have cultural, economic and heritage significance as grazing lands used by generations of farming communities and some even show the remains of lazy beds where potatoes were grown historically. Under Article 17 of the EU Habitats Directive, Ireland is obligated to monitor and assess the conservation status of Annex I habitats and BEC Consultants were contracted to carry out this work in 2017-18. 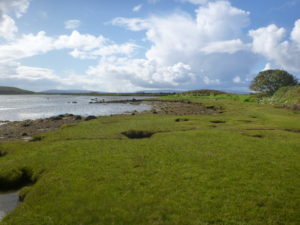 A baseline survey of saltmarsh in Ireland was carried out by the original Saltmarsh Monitoring Project (2006-2008). The National Parks and Wildlife Service selected 83 existing and newly selected sites as a representative monitoring sample for the 2017-18 monitoring survey to satisfy the requirements of the Habitats Directive monitoring and also the Water Framework Directive (WFD) monitoring. These sites contained a substantial proportion of the total national resource for each habitat as assessed during the baseline survey (McCorry & Ryle, 2009) and others identified in the inventory (Curtis & Sheehy Skeffington, 1998). The methodology used to collect and analyse data for conservation assessment was adapted to allow the data to be used for both the Habitats Directive monitoring and also monitoring under the WFD using SMAATIE.